This past weekend was all about taking it easy. My life stays pretty hectic between working full time, blogging, being a mom, being a wife, and living life, so I really appreciate a low key weekend that gives me a chance to unwind. Kane and I headed home to eastern Kentucky for the weekend. Did you notice anything different about my hair?! While there, Della and I had got our hair done by my hair stylist, Ginger (love her!). I got a much needed trim and color change. Ginger darkened the base color slightly for a little more intensity, and wove some highlights underneath the top layer. Head over to Della’s blog to check out her new cut and color, and see a bright outfit that’s perfect for spring:) By the way, she shot these photos–thanks, friend! To me, weekend style is all about being comfortable. 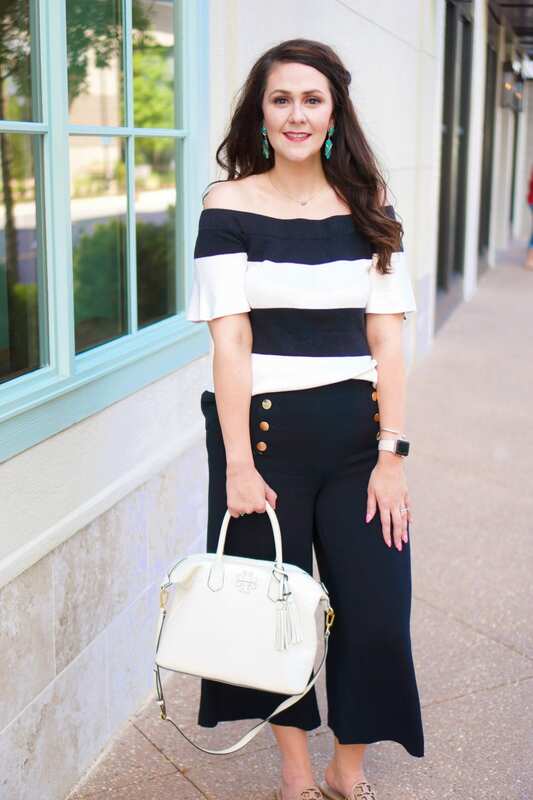 I like to find stylish pieces that aren’t fussy. This outfit was a recent sale find from Old Navy. 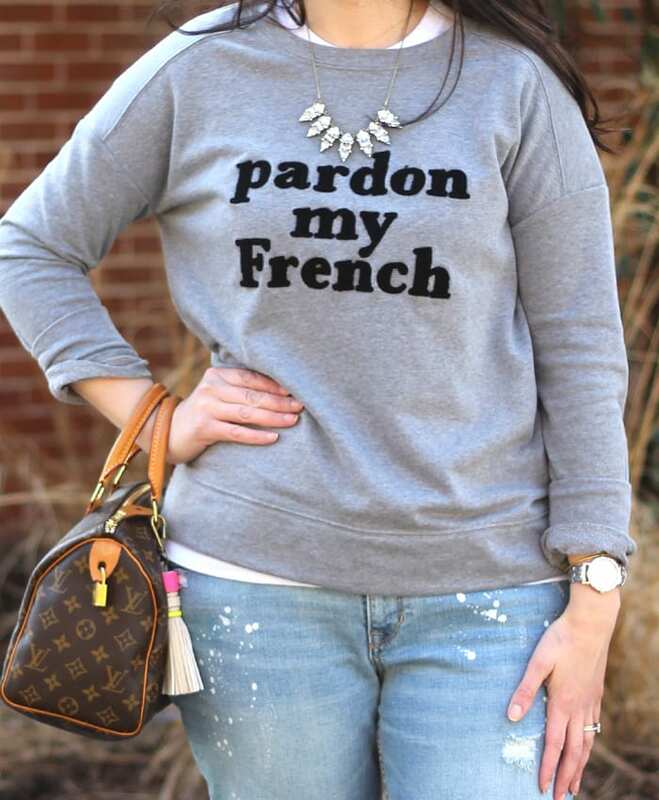 The sweatshirt was only $7, and I went up a size in it for a more relaxed fit. The jeans were on sale for $21. I’d been price stalking them for a while because I loved the paint-splattered look and boyfriend fit. 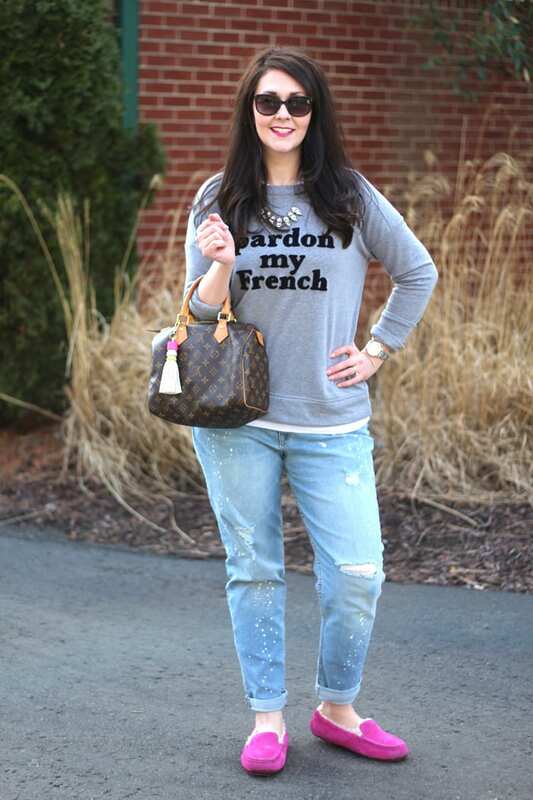 Distressed denim is also majorly in for spring–you can see another recent distressed denim look here. I’d almost recommend going down a size in these jeans if you order them. You want them to be casual but not sloppy. And don’t forget to roll your jeans at the bottom! I paired this look with my necklace and earrings from my latest Rocksbox. 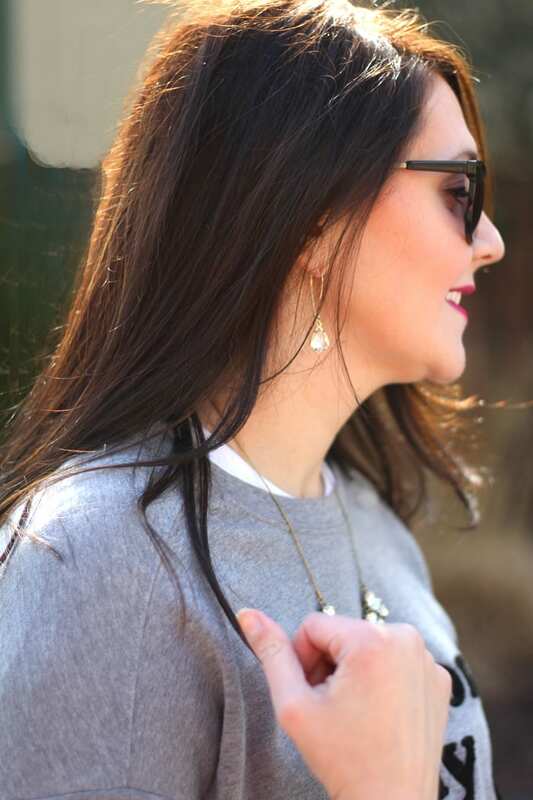 These pieces work well to dress up a more casual look without being over the top. I suggest wearing accessories that are more clear crystal with a look like this. You can find out more about Rocksbox here, or you can head on over to the Rocksbox website and use code BRIGHTONABUDGETXOXO to get your 1st month of Rocksbox FREE! As for my shoes, I’m a die-hard fan of moccasins. These are the Ugg mocs that I recently picked up on major clearance from Dillard’s, and I’ve gotten so much wear out of them. 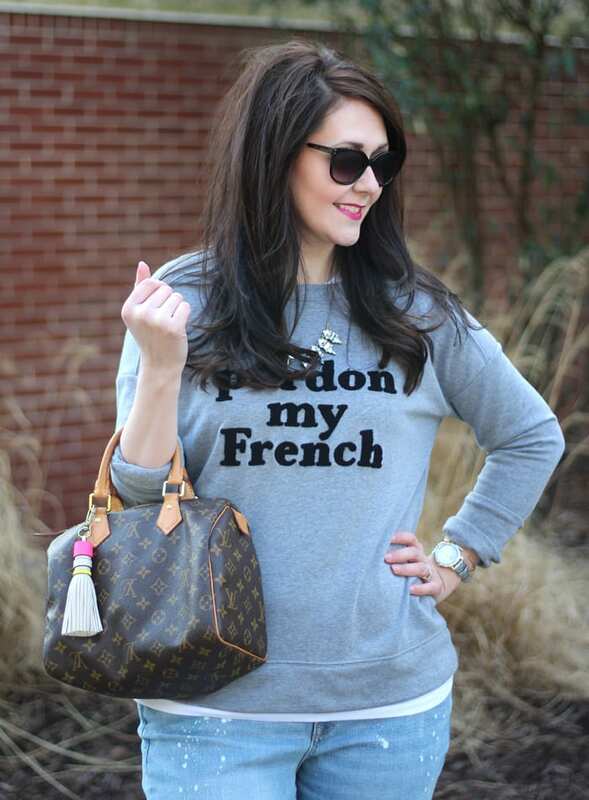 The bright color ups the style factor and adds an interesting pop of color to my outfit. 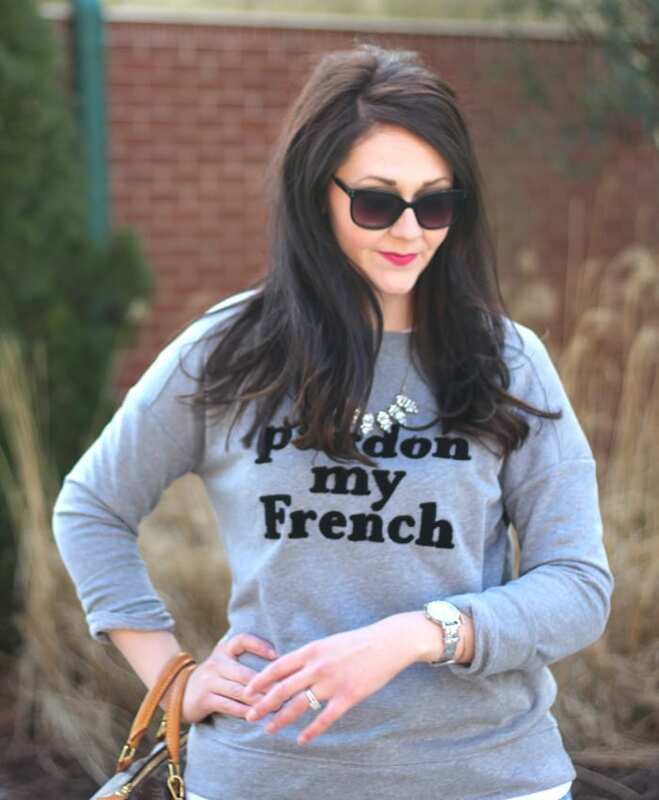 My friend Becky over at BYBMG is also showing off a cute sweatshirt look today, so be sure to check out her post. 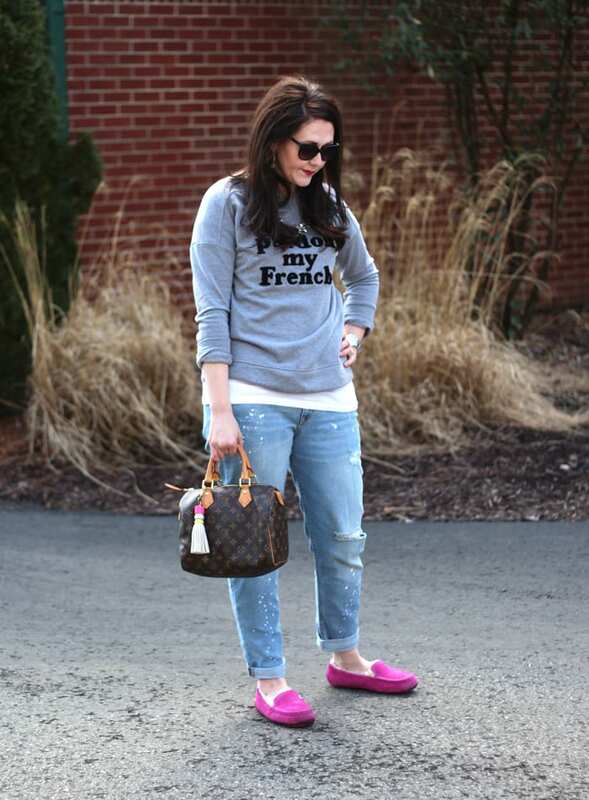 We’re both linking up with Anne in Residence and What You Make It for Mom Style Remix. Also linking up with BYBMG for Tuesday Talk and Garay Treasures for Bloggers Who Have Inspired Me.